Venezuela's government devalued the bolivar by 96 percent on Tuesday under a new exchange rate announced by the central bank as it desperately tried to steer a way out of its economic crisis. 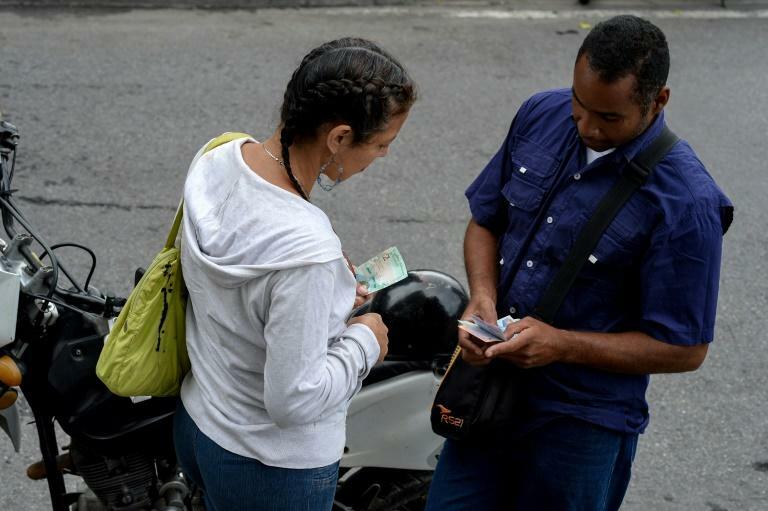 The announcement comes a day after new banknotes stripped of five zeroes entered circulation as part of a radical plan by President Nicolas Maduro to curb hyperinflation, though business leaders criticized the move as counterproductive. Expressed in the previous "strong bolivar" currency in effect until Monday, it amounts to a hike from 248,210 to 6,000,000 to the dollar. Some businesses remained shut in order to cope with the currency adjustments, while others joined a 24-hour strike called by the three main opposition parties to reject Maduro's policies. "The banks are working and giving cash. I've been able to make transfers and payments, and everything is normal," Cesar Aguirre, a 38-year-old accountant, told AFP after withdrawing money. The socialist president, elected for another six-year term in May elections rejected by much of the international community as fraudulent, has fixed the currency to the country's widely-discredited cryptocurrency, the petro, which is in turn linked to the price of a barrel of Venezuelan oil. "Anchoring the bolivar to the petro is anchoring it to nothing," Vicente Leon told AFP. Andres Velasquez, one of the opposition leaders behind the strike call, estimated said "60 percent" of the workforce had followed the strike, mostly in the provinces. Some 2.2 million Venezuelans have fled the crippling economic and social crisis that developed under Maduro's rule, with the International Monetary Fund projecting inflation to reach a staggering one million percent by the end of the year. The new currency is part of an economic plan unveiled last week by Maduro that also includes a 3,400 percent increase in the minimum wage and a hike in gasoline taxes, which for years have been the world's cheapest. Inflation that the International Monetary Fund predicts will reach one million percent this year rendered the old bolivar currency practically worthless, while the economic crisis has driven more than two million people to flee the country, according to the United Nations.